By Daniel Horowitz--For the second straight year, Greater Toronto’s Jewish Community Centres simultaneously celebrated the holiday with its Chanukah Across the City event. Regardless of whether you were uptown at Vaughan’s Schwartz/Reisman Centre on The Joseph and Wolf Lebovic Jewish Community Campus, midtown at the Prosserman JCC on Sherman Campus at Bathurst and Sheppard, or downtown at the Miles Nadal JCC at Bloor and Spadina, UJA Federation’s three centres of Jewish life in the GTA united Jews of all ages and backgrounds interested in enjoying this festive holiday. 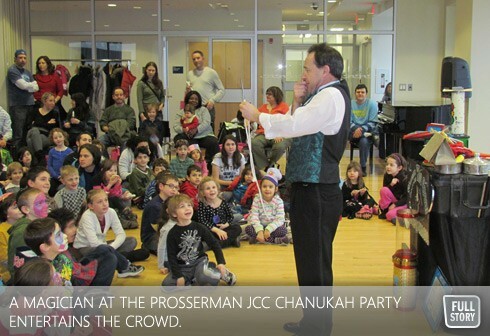 All together, over 1,500 participants filled the JCCs and enjoyed delicious holiday treats, singing, dancing, entertainment and plenty of ruach (spirit). Chanukah Across the City was presented by UJA Federation of Greater Toronto and sponsored, in part, by the Kolel Legacy Fund at the Jewish Foundation of Greater Toronto.